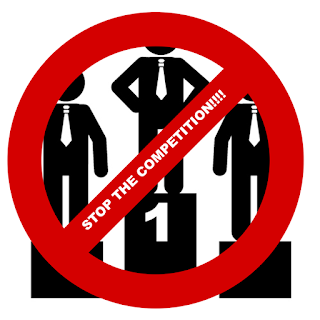 Competition is a common enemy that we all collectively have to fight. The hard part is that even those that compete still suffer from the same negative consequence of this trait. So let's discuss how to handle it, but first, we would look at why you don't have to compete and why some do it. I am writing based on the many years of experience I have gathered from the work environment. I am actually writing not out a ill-feeling but out of a desire to let fellow employees learn from my wealth of experience. Why Some Persons Compete One question you always need to ask is why things go the wrong way, except that some persons are so engrossed in their jobs that they don’t take some time to consider things from various perspectives. Let’s first outline why some choose to compete instead of aim for excellence. 1. Lack of Well Thought-out Goals If one does not have set objectives in our career, then one taking actions and decisions that lack focus. This is even worse when the decision impact negatively on persons in your team. An example would be a team member in the ICT department that fails to improved his skills and knowledge-base to keep pace with the latest trends in technology. What happens when other team members tends to move at a faster pace? He would end up seeing them as a threat. But the truth is this: In the ICT world, nobody is a threat to anyone. 2. Incompetent Persons in Position of Authority When you have an incompetent persons in position of authority, the result would be a team that is not coordinated. Especially when managerial skills is lacking, then he would not have a grip on the members of the team. When a more competent team member works on the team, he naturally sees him as someone to compete with. I personally have go grapple with this particular issue for a time in my workplace. 3. Lapses in the Logistics/HR Department of the Organization The role of the logistics/personnel department of an organization is to handle issues related to personnel as well as relationship between members of the organization. If in a department, a not very professional technician is elevated above engineers, the result would be unnecessary competitions. I also experience a similar situation during the years I would with an Oil Servicing/Construction company. When persons are elevated to managerial positions due to their technical skills, the result is also unpleasant and is known as ‘Halo Effect’ in Project Management. Another serious lapse would be when the company lacks standards in terms of salaries of employees. Lack of standards kills productivity. Assuming there is no standard in terms of the monthly salary. Then you find out that an employee with a degree and several relevant certifications is paid a fraction of the salary of another employee with just a high school diploma. 4. Preferential Treatment of a Female Employee for Whatever Reason Some employees in positions of authority have abused this position by allowing their rapport with a female employee to affect the job to the detriment of other employees and the job at large. I would stop here and hope you understand what I’m saying. I would like to give a few words of advice to my beloved colleagues in the workforce to enable them cope with this ugly trend. One thing to bear in mind is that you may not be able to change the existing structure of an unprofessional work environment. You can change your viewpoint and attitude towards the situation. The following points would help you cope. 1. Define Your Goal in Your Workplace This is the first thing you need to outline possibly as soon as you take up the employment. Having goals you give you a focus. Do you want to work with the company for 2 years, 5 years, 10 years? Do you plan to spend the rest of your career life in the particular company? Do you aspire for top position of a manager? Do you want to learn on the job? Interpersonal skills also known as soft-skills allow you to maintain good relationship with your colleagues. This kind of skill tends to create to ease any tension that may result. This may means spending few minutes discussing general issues of life(not related with job) with colleagues or acknowledging his efforts or even a pat on the back. O maybe simply asking about the family. We need to make needed effort to avoid making the workplace a competition ground. If we are caught in between, we need try to ease the tension created by applying the 4 points I made. Thanks a lot for reading and if you do thing that this article needs to be improved, feel free to leave a comment below on your views.